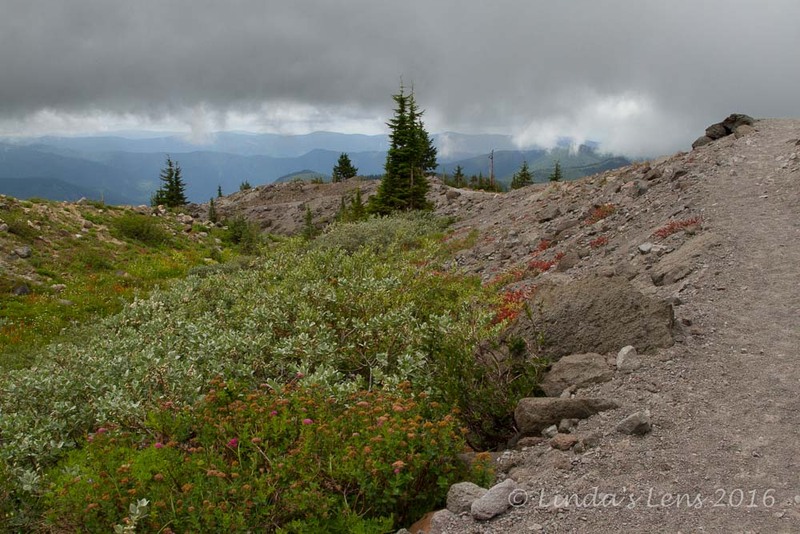 After tackling McNeil Point on Friday, recovering Saturday, Sunday I was ready for more. 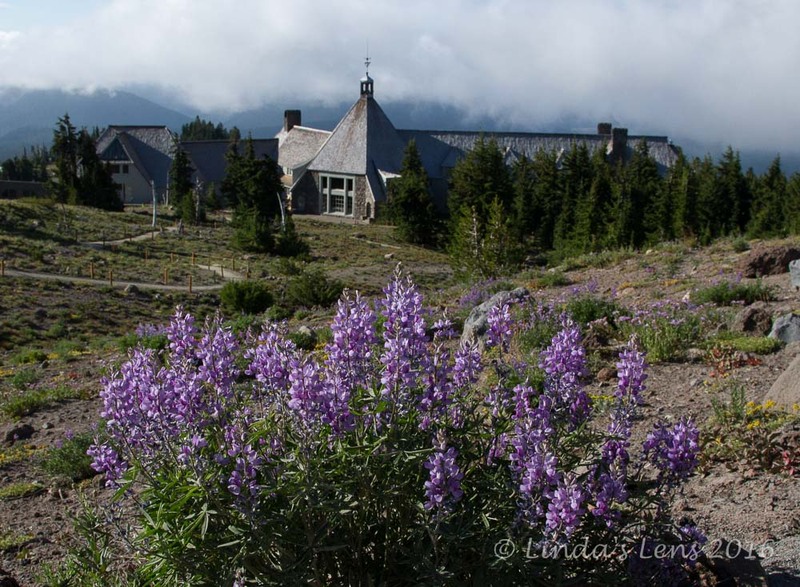 So back up to Mt Hood I drove, this time destination Timberline Lodge. Another fave summer hike was on the agenda - a trek to the lovely wildflower meadows of Paradise Park. The hot summer temps had given way to a cloudy, cool morning. Weather in transition, rain was forecast the following day. Not a fan of heat, I was more than happy for this fall-like weather. 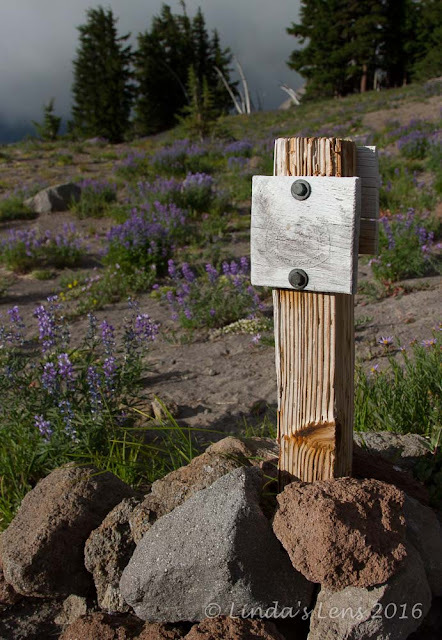 Parking in Timberline's "climbers lot" gave me immediate access to the Pacific Crest Trail (PCT). Following it across the bare ski slopes above the lodge, I wandered past a huge field of luscious purple lupine. Mt. Hood, partially cloaked in low-hanging clouds, peeped out for a quick cameo. I also got a few quick glimpses towards Illumination Rock, looking awfully barren for early August. Quite a difference from last December's ski trip! 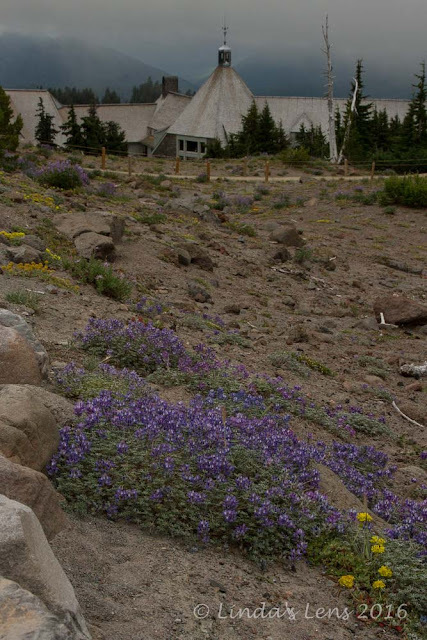 Looking downslope on the famous Timberline Lodge, I couldn't resist a photo of this brilliant lupine patch. The PCT was well-defined here. Not only nicely graded, someone had lined the path with rocks. Timberline's chairlifts were still running too. 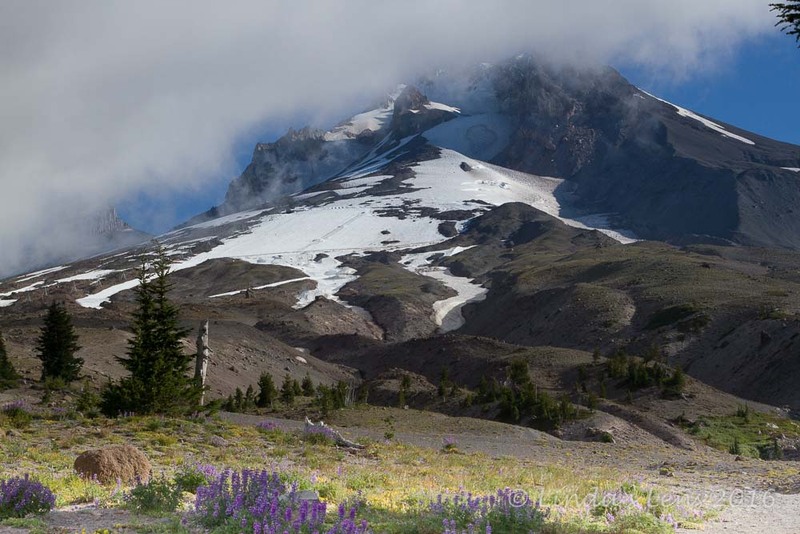 This ski area is well known for it's summer ski season high on Mt Hood's glaciers. I saw a few ski camp kids heading that way, toting their boards. Even at my early start time (unlike Friday's hike, I'd arrived by 8:30 am) the trail was busy. I was joined by quite a few daytrippers - guests of Timberline Lodge. And several backpackers passed me going the opposite direction. 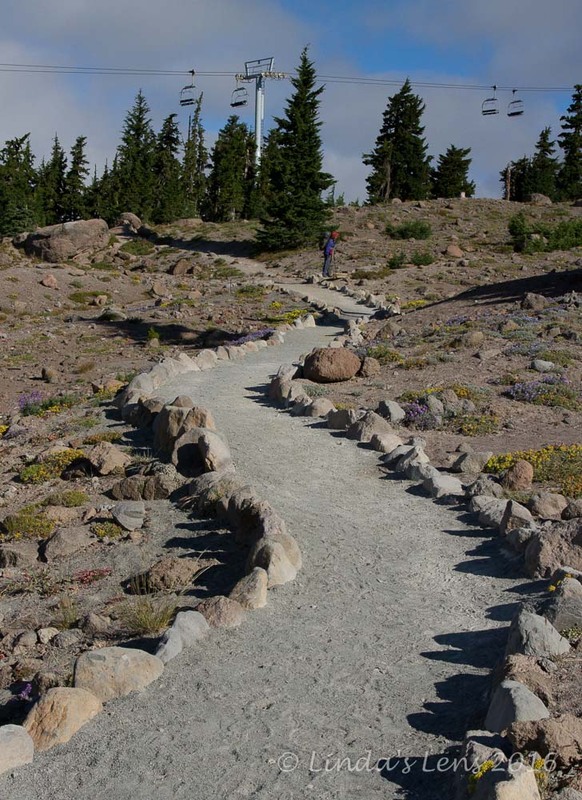 Some were wrapping up a weekend trip, and others were hiking around the entire mountain on the Timberline Trail. 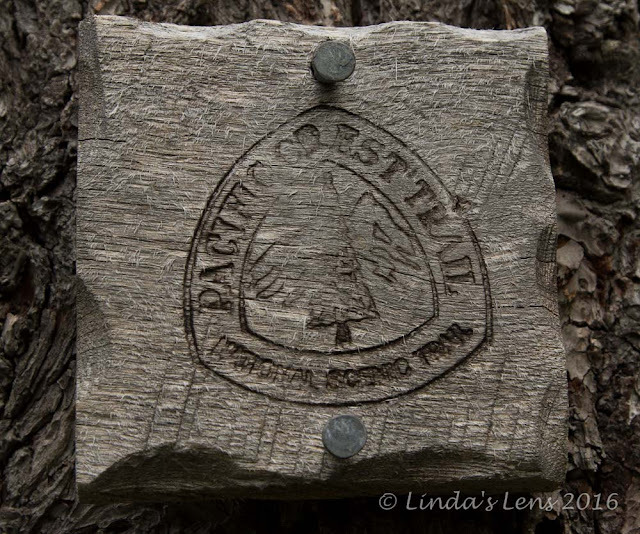 But a few folks I met were hiking the entire Pacific Crest Trail (PCT). I met several southbounders who told me they'd begun their hike at the Canadian border. 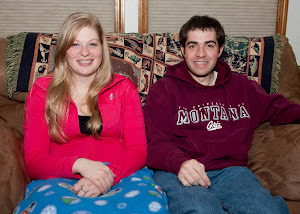 These people have my total admiration for attempting such a grand adventure. Rock stars of the hiking world! 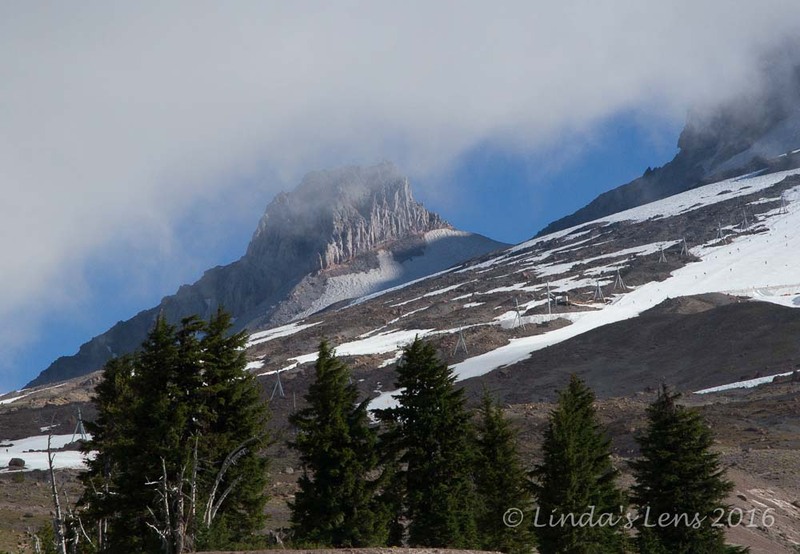 Leaving the ski area, I crossed into the Mt Hood wilderness. 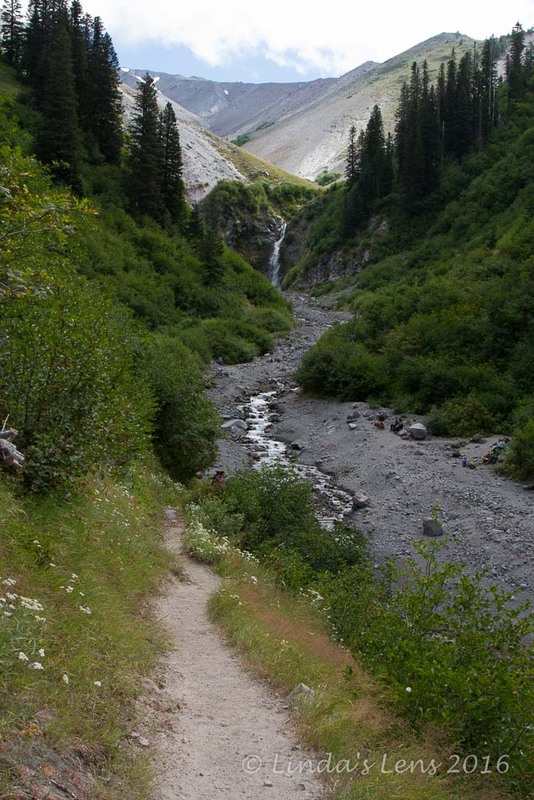 The path dipped down across Little Zigzag Canyon's deep gully. In past year's trips the running creek created a small crossing issue, but today it was bone dry. 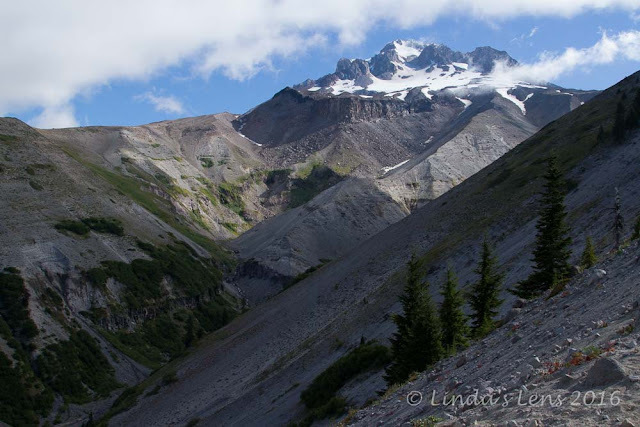 Climbing out of Little Zigzag, I continued my hike across a series of forested switchbacks. Then, the trees cleared, and I found myself staring into Zigzag Canyon's huge abyss. 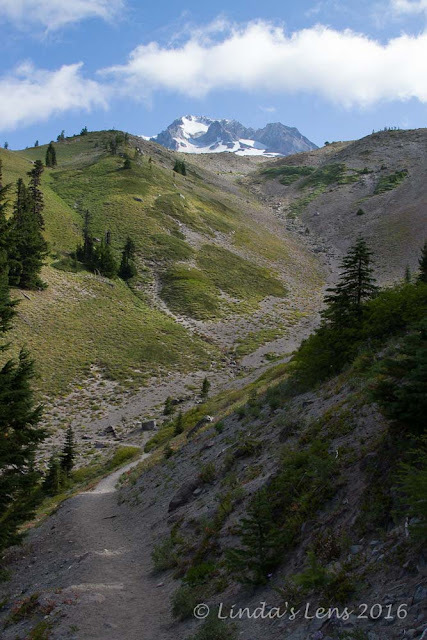 Over time, the Zigzag River has cut a 700-foot deep chasm into the side of Mt Hood. 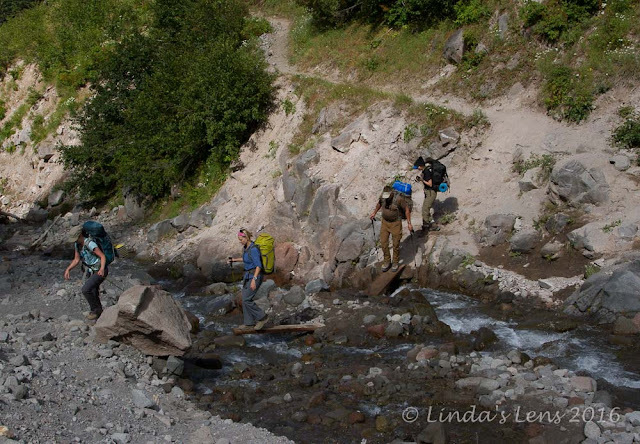 Hikers must descend down a steep trail to it's very bottom, and ford a gushing glacial stream. Although I'm always nervous about water crossings, a series of strategically-placed boards made passage a snap. Now I had to climb up the canyon's other side. A long, tiring trek I concentrated on putting one foot in front of the other, and before I knew it I'd arrived at the junction with the Paradise Loop Trail. Not much further to Paradise Park's famous flower fields! I eagerly started up yet another steep, twisty trail. The back to back climbs were starting to do me in. Luckily, there were huge fields of lupine providing distraction from my misery. 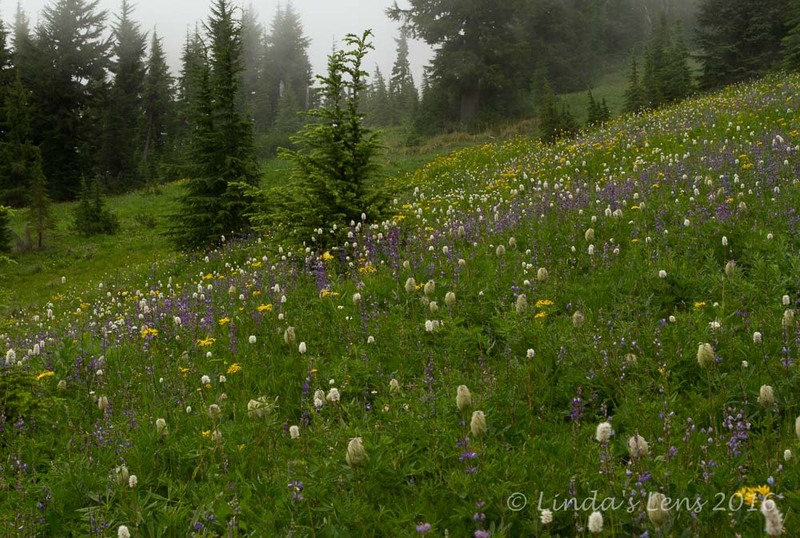 Finally, the lupine parted and I found myself in the midst of the often-photographed flower field of Paradise Park. Sadly, the prolific blooms I'd seen in past year's trips seemed to have taken this season off. And Mt Hood also decided to hide behind the clouds. Still it was lovely. I took a short break and chatted with a nice French couple who'd been backpacking nearby. Bidding my trail friends goodbye, I continued my journey following the loop trail. Another meadow had a bit more wildflower variety, and the low-hanging fog added some drama to my photos. 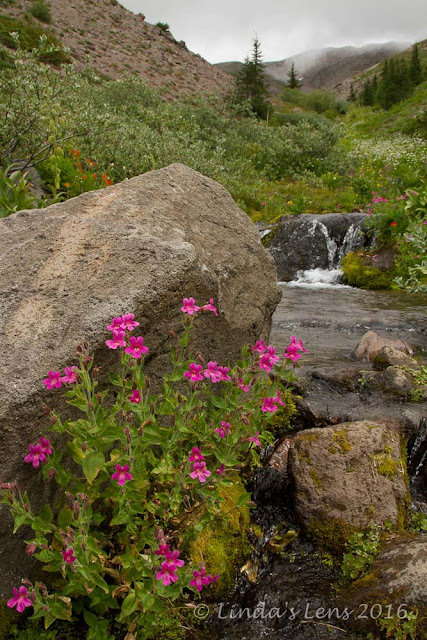 Passing by a small creeklet, a nice patch of pink monkeyflowers grabbed my camera's attention. I stopped at a nearby campsite and took a quick lunch break. As I ate, the clouds dipped lower, and the wind began to pick up. Chilled, I opened my backpack and put on every bit of clothing I was carrying. Wild-haired "hippy on a stick"
I needed to warm up. Time to get moving again! 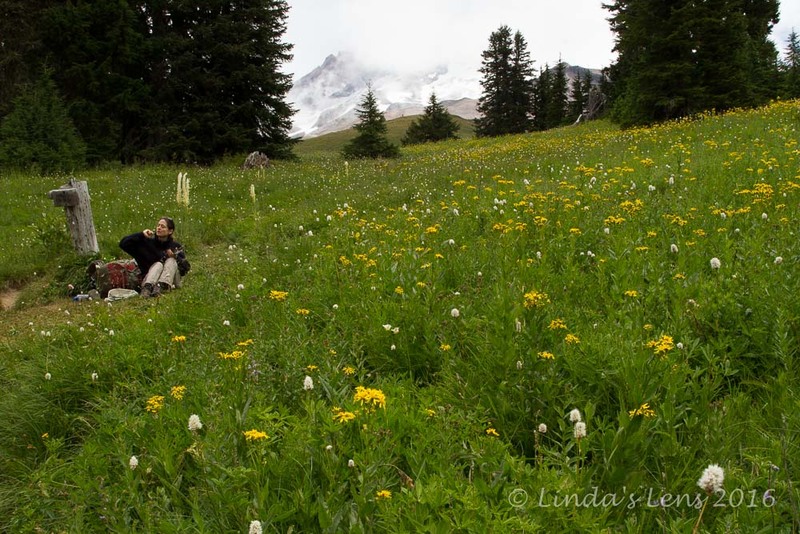 Continuing past the campsite, the forest opened up into a spectacular alpine meadow. 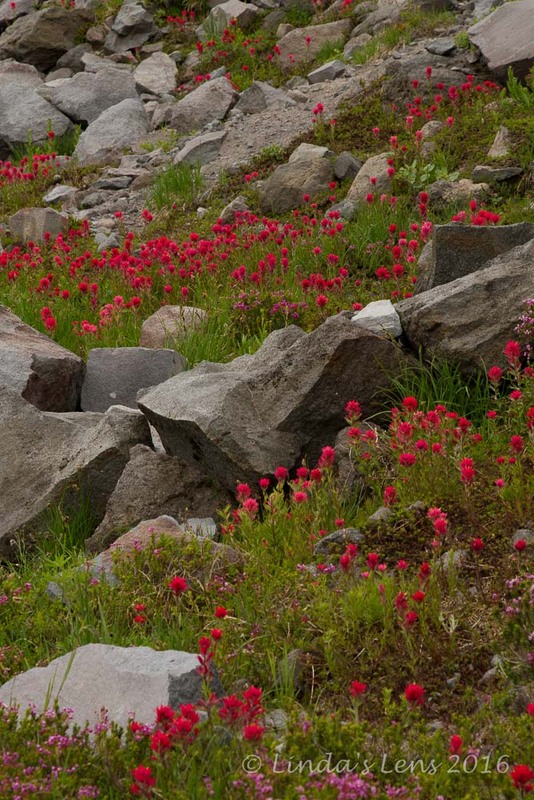 I passed by a huge patch of pink heather and magenta paintbrush. Oh it was stunning! Although this high meadow boasts wonderful views on sunny days, I wasn't disappointed to be missing out. The low clouds were fascinating to watch. Every once and awhile they'd part, offering teaser glimpses of the foothills below. I crossed one fabulous flower meadow after another. 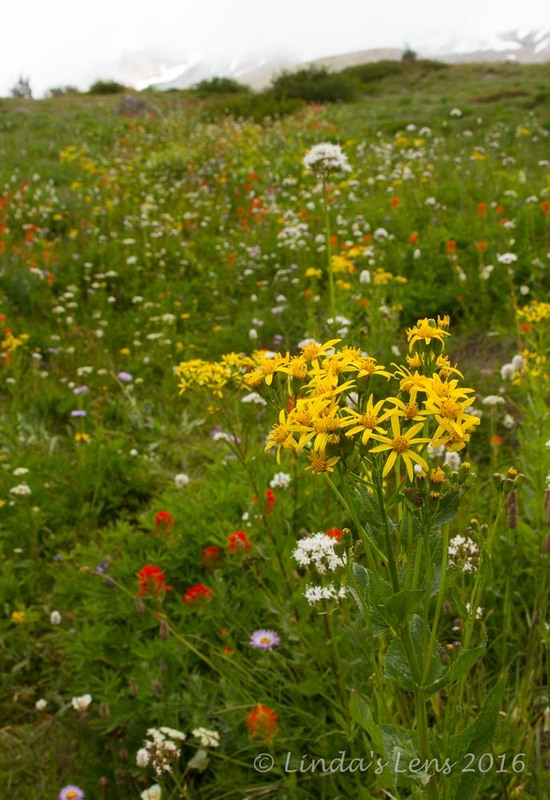 Although most of the wildflowers appeared to be past their prime, it was still a great display. 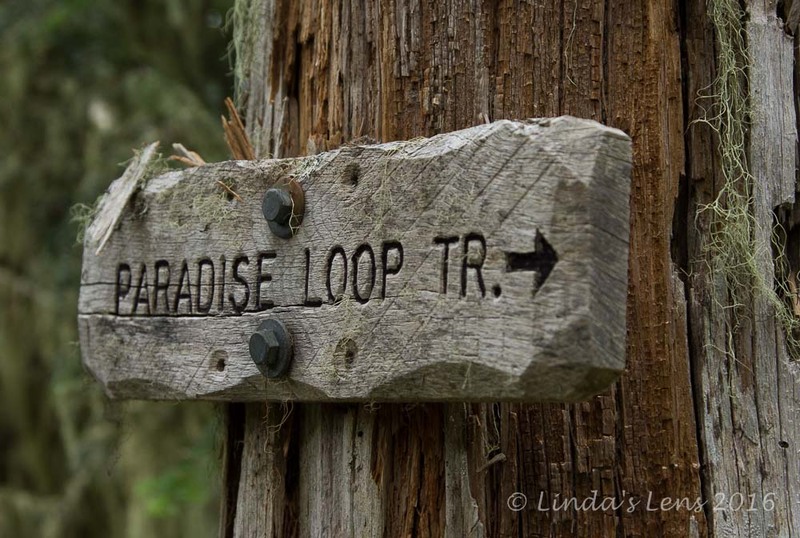 Finally, the Paradise Loop reconnected with the Timberline (and PCT) trails. I had a long 2.5 mile trek across this dull portion before retracing my steps down Zigzag Canyon. However, this section turned out to be anything but dull. I spotted more wildflowers, crossed under a shimmering waterfall, and chatted with another group of PCT southbounders, eagerly anticipating the legendary hikers buffet at Timberline Lodge. Climbing down Zigzag Canyon, my right foot began to hurt. 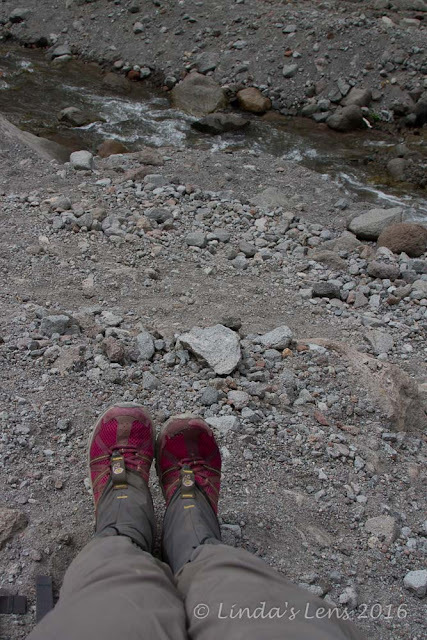 Although I usually hike in my trusty Lowa boots, today I'd tried out some lightweight trail shoes. The shoes did great until I began heading downhill. It was then I discovered my right shoe was apparently a tiny bit too small, as my outer toes were rubbing against the end. But...after reaching the bottom of Zigzag Canyon, most of the final 2.5 miles of this trail were uphill. Other times I might have complained about ending my hike with a climb, but today it was totally okay. Uphill steps would keep my toes away from the rubbing end of the shoe. Glad to see Timberline Lodge again! The final miles of any hike are always the longest, and today's trek was no exception! 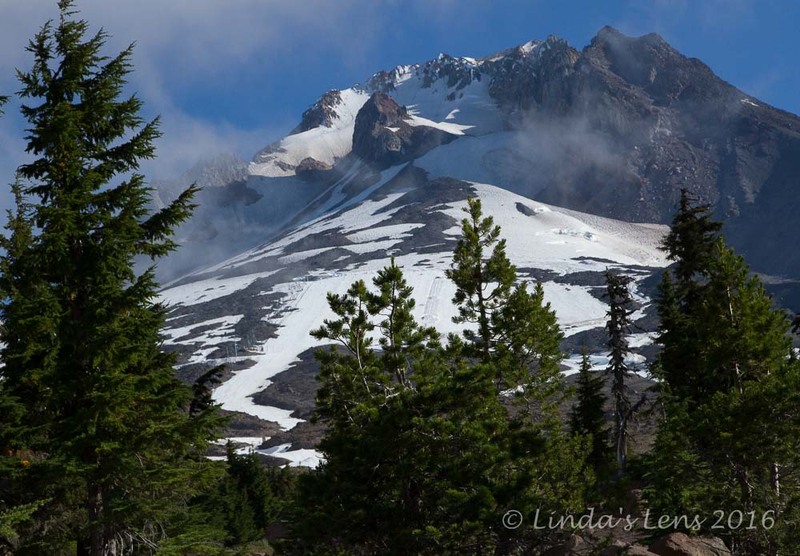 I was never so happy to see Timberline Lodge come into view. 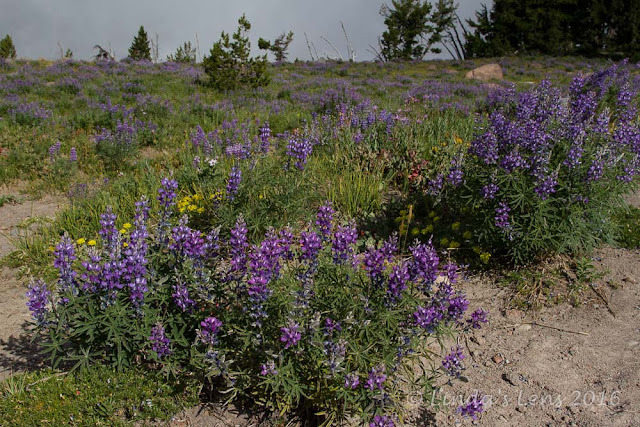 Although I had a bad case of "horse in the barn" syndrome by then, I still couldn't resist one last photo of this amazing patch of lupine near trail's end. Stats: 12.5 miles round-trip, 2300 feet elevation gain. Wonderful hike you took us on. Love the terrain and the low clouds. I can't imagine living where clear blue skies prevail.. I'd go nuts. 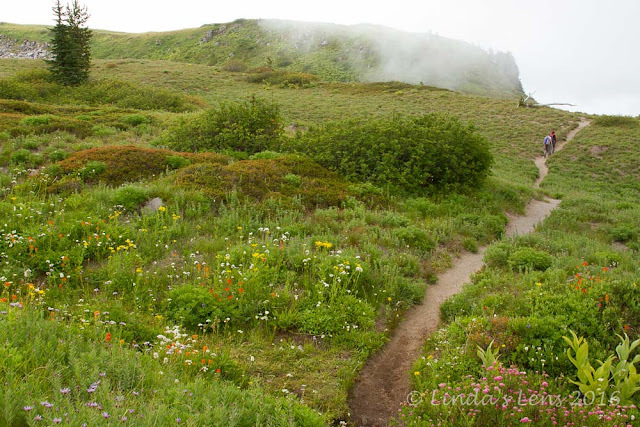 Love the touch of fog in these images as well as the paths leading to the mountain peaks. Beautiful flowers and nice place to explore. What gorgeous, breathtaking views, Linda!!! Fico maravilhado com estas belas caminhadas por estas montanhas espectaculares e muito belas, um hino à natureza. Hello, you are just an amazing hiker. This hike was beautiful. I loved the views and the gorgeous wildflowers. The paintbrush is beautiful. The lodge is one place that looks familiar from one of our visits. Awesome series of photos. 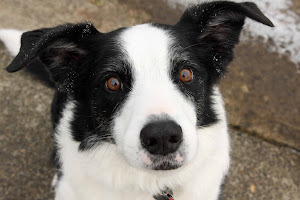 Happy Friday, have a great weekend! What a gorgeous place, Linda! The mountain views are very beautiful. What you saw was well worth the effort. This section of the pct is on my list for next summer. I hope this post was from awhile ago or those SOBOs won't make it through the Sierra. Sensational. Would so love to be walking through these Paradise Trail, fields with you. 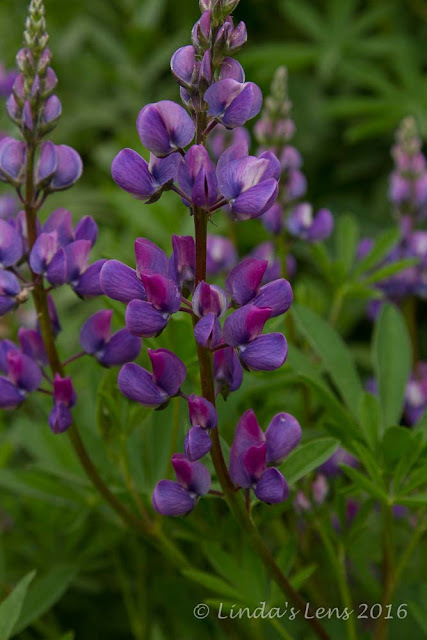 I love our Spring wildflowers but you just don't get the mass effect that Oregon has. I also think they have greater impact because these are the flowers we try to grow in our tropical gardens and of course they don't survive. Thanks also for taking me back to familiar Mt Hood views. Isn't August a little late for southbound PCT hikers to be at Mt. Hood? I hope they were section hikers than those bound for Mexico. Gorgeous flowers! I've been on this trail and in late September, it looks much different! What a spectacular hike! That west coast seems to have no end of spectacular mountain trails! Such a beautiful hike and great photos. I always hike in my trail boots, never anything lighter, as I like the ankle support they give - they've saved me from turning an ankle more times than I'd like to admit. 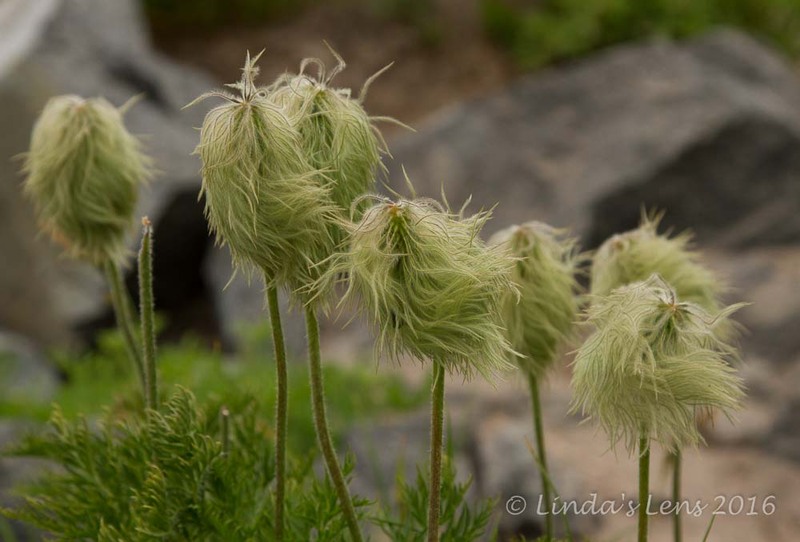 A long, hard hike but you were rewarded with those views and flowers. I agree that those who hike the PCT are rock stars. I've read some of hteir journals. Zig Zag Canyon looks difficult but beautiful. You deserved a treat after finishing. What shoes did you get? I'm still looking for lightweight hikers and don't remember seeing any like those. I'd love to get up here soon, although I'm sure the flowers must be finished by now. Can't imagine hiking the Pacific Crest trail entirely. Very impressive for those who can do it! Wow 12 plus miles, you could hike to Canada. The flowers are beautiful with stunning views! Beautiful! 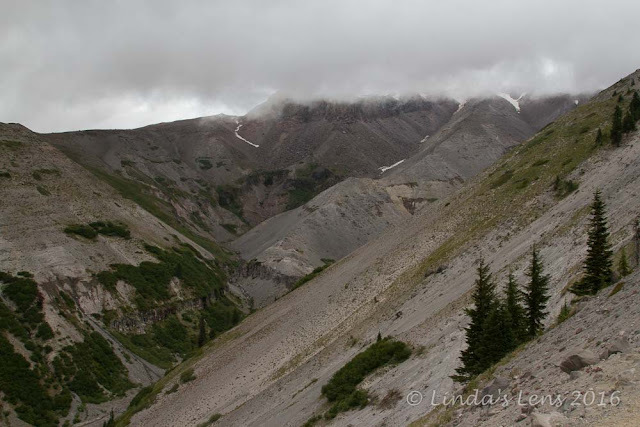 Such refreshing pictures, and I get a real sense of the weather on this hike. I love that 1st photo with the clouds, Mt. Hood, and lupine in the foreground, just lovely. 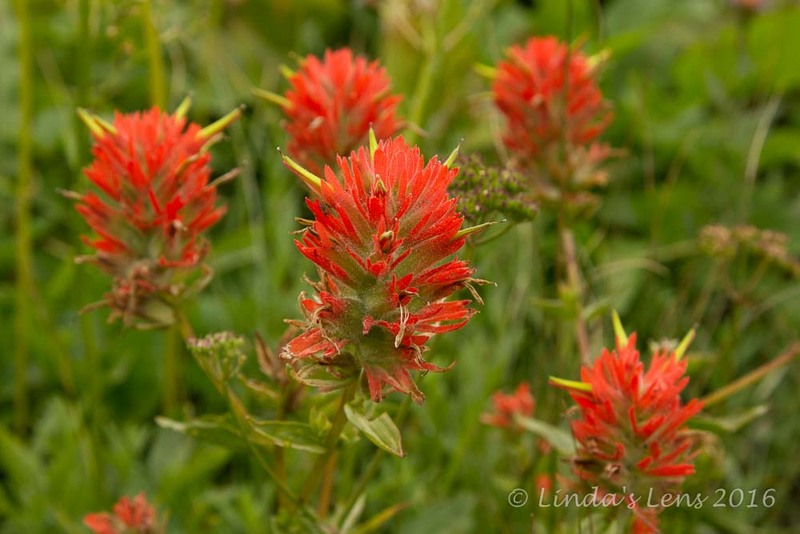 I wonder if the hotter than usual summer was the reason you saw less wildflowers this year? I love hiking on foggy days like this as it makes the trails look so mysterious! Hi! 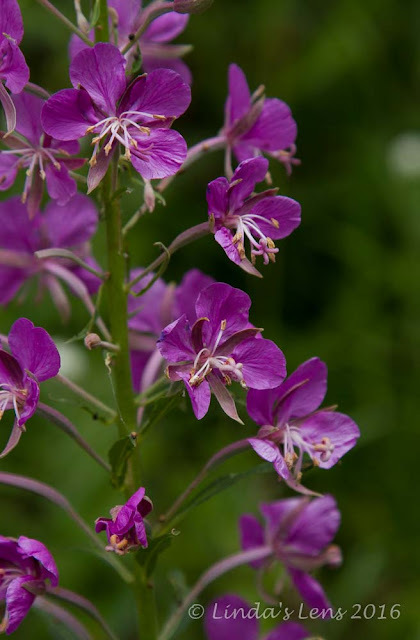 There are many beautiful wild flowers. The scenery is very beautiful even though the low clouds sky. I always think that you would enjoy meals both in the mountain and in your house after coming back from the trekking. Thanks for sharing. The scenery and wildflowers are just stunning. You have such wonderful scenery in your part of the world! Gorgeous! I love the flowers and the mountain tops.